CNB’s Round Rock Branch President, Brian Cauthorn, has been around banking since childhood, spending time at his cousins’ Del Rio Bank & Trust. Now with 25 years of banking experience underfoot, he’s earned a reputation of going above and beyond to provide excellent service to clients. Cauthorn is a fantastic resource, having underwriting experience of every stage in the loan request process. 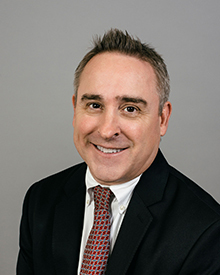 With his history as a credit analyst, private client services officer, and commercial lender, Cauthorn has plenty of valuable expert guidance to share. Cauthorn holds a B.B.A. in Finance from the University of Texas, as well as a Master of Public Administration graduate degree from U.T.S.A. As a firm believer in providing children with access to a quality education, he has strong ties to Round Rock ISD Partners in Education. He feels that building strong, long-term relationships is done through earning trust and demonstrating mutual respect. Cauthorn’s appreciation for these age-old values has helped him successfully establish CNB’s presence in its newer Round Rock market. Having grown up in the small town of Del Rio, Texas, Cauthorn enjoys spending time in the outdoors. As both a dog and cat fan, he encourages animal adoption and has even added two rescue dogs to his family. Lastly, Cauthorn understandably “loves” UT football, as well as going on the fun-loving beach trips his family cherishes.